Portable phone chargers (also known as power banks) have emerged as a must have device for smartphone users. Portable chargers enable you to recharge your iPhones or Android smartphones up to as many as 10 times without worrying about finding a wall outlet. We have exhaustively used, tested and compiled this collection of best portable phone chargers currently available in the market to come with with our picks for best portable chargers to suit every need, requirement and budget. RAVPower 6700 is our next pick as a low cost portable battery charger. RAVPower 6700 will fully charge iPhone 7, 8, 6S two times. It will also fully charge Samsung S9, S8, S7, etc. from 25% to 100% two times. RAVPower 6700 weighs just 4.1 oz and has dimensions of 3.5 inches x 1.5 inches x .98 inches. It has a robustly constructed fire-resistant design with one 2.4 amp USB charging port. RAVPower 6700 can be fully charged in 3 hours using a 2 or 2.4 amp wall charger. RAVPower 6700 portable charger charges all iPhones and Android phones at quite fast 2.4 amp charging speeds. This means that it will charge iPhones 8, 7, 6s etc. to about 50% in about 40 minutes and most Android phones to about 35-50% in 45 minutes. Pocketable and light at 4.1 oz. .98 inches thickness. A slimmer but wider phone-like design would have been more pocketable. PowerCore II 6700 is our next top pick as best ultra-compact, light weight, and low cost portable charger. At 5 oz (150 gm), it is remarkably light in the pocket and weighs same as most modern smartphones. PowerCore II 6700 will fully charge an iPhone 8, 7, or an iPhone 6S twice. It will also charge Samsung S9, S8, S7, etc. and Apple iPhone XS, X, XS Max, 8 Plus etc. from about 35% to 100% twice (about 1.3 charges). PowerCore II 6700 weighs just 5 oz and is very tiny at just 2 inches x 3 inches x .9 inches. This portable charger has a modern scratch resistant grippy design. PowerCore II 6700 can be fully charged in 3 hours. It will charge most iPhones and Android phones at fast 2 amp charging speed. This means it will charge iPhones 8, 7, 6s etc. to about 50% in about 45 minutes and most Android phones to about 35-50% in 45 minutes. Grippy scratch resistant design. Best design among compact chargers. White color version is priced higher! Astro E1 6700 is Anker’s previous generation 6700 mAH powerbank model. Astro E1 6700 is priced slightly lower than the newer PowerCore II 6700 portable charger. Despite its age, the Astro E1 6700 is an excellent ultra-compact, and light weight and low cost phone charger with its only drawback being it slow charging speed as it takes about 5.5 hours to charge itself fully. Astro E1 has a four-point led battery status indicator while PowerCore II 6700 has a better 6-point status indicator. Astro E1 6700 will fully charge iPhone 7, 8, 6S twice and charge Samsung S9, S8, S7, etc. from 35% to 100% twice (about 1.3 charges). Astro E1 6700 weighs just 4.4 oz (120 gm) and has exactly same dimensions as PowerCore II 6700 – 2 inches x 3 inches x .9 inches. Astro E1 6700 also has same 2 amp charging speed that charges charge most iPhones and Android phones to about 50% in about 45 minutes. PowerCore II Slim 10000 is our top pick among mid-range phone chargers. 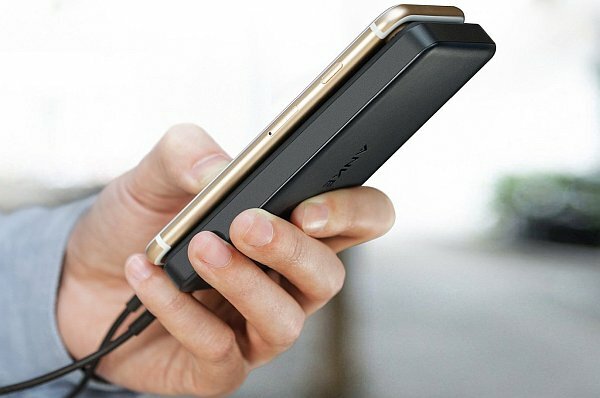 The special thing about PowerCore II Slim 10000 is that it is Anker’s lowest cost portable charger that offers fastest 18-watt charging for latest Android smartphones including Samsung S9, S8, S7, etc. Besides, it will also charge iPhones 8, 7 , 6, 5 etc. at fast 2.1 amp charging speeds. PowerCore II Slim 10000 will fully charge Samsung S9, S8, S7, etc twice. It will charge iPhone 8, 7, 6S three times and iPhone X, 8 Plus, 7 Plus twice. PowerCore II Slim 10000 weighs just 8.8 oz and is just .6 inches thick (5.4 x 2.4 x .6 inches) making it pocketable and easy to hold in the hand along with the phone. PowerCore II Slim 10000 can be fully charged in 4 hours with a Quickcharge wall charger. PowerCore II Slim 10000 will charge most Android phones such as S9, S8, S7 to about 50% in 30 minutes. This portable charger will charge iPhones at fast 2.1 amp charging speed – about 50% in about 45 minutes. PowerCore 13000 Compact is easily our next top pick as best compact, mid-range portable charger. PowerCore 13000 Compact will fully charge iPhone 7, 8, 6S etc. four times. It will also fully charge Samsung S9, S8, S7, etc. almost 3 times. The best thing about PowerCore 13000 Compact is that it weighs and costs as much as most 10000 mah portable chargers but delivers full 30% extra battery capacity (one more charge for same weight and price). PowerCore 13000 Compact portable charger has two USB ports and is an excellent charger for both iPhones and Android Phones. PowerCore 13000 Compact can be fully recharged with a 2.4 amp wall charger in 6 hours. PowerCore 13000 Compact will charge iPhones 7, 6, 5s at their fastest possible charging speed (2.4 amp or 12 watt) charging speed which charges iPhones 8, 7, 6s etc. to about 50% in about 45 minutes. Please note that while it does not support fastest peak charging speed (18 watt) for the latest fast charging Android smartphones, PowerCore 13000 Compact can charge Android phones at up to fast 15 watt charging speed (3 amp) that will charge most Android phones to about 35-50% in 45 minutes. Great balance of battery capacity, price, charging speeds and weight. PowerCore 13000 Compact is one of Amazon’s bestselling portable phone chargers for this reason. White color version is priced way higher! RAVPower 10000 QC 3.0 is our next pick as a 2-3 charge portable battery charger. RAVPower 10000 QC 3.0 will fully charge iPhone 7, 8, 6S three times and fully charge Samsung S9, S8, S7, etc. more than two times. RAVPower 10000 QC 3.0 has a very slim design with a width of just .63 inches and weighs about just 6.8 oz with exact dimensions of 5.75 x 0.63 x 2.83 inches. The slim design and light weight make this portable charger one of the most pocketable and lightest 10000 mAH portable battery chargers in the market. RAVPower 10000 QC 3.0 phone charger is slim and ergonomically shaped with rounded edges. The highlight feature of RAVPower 10000 QC 3.0 portable charger is that it has both QuickCharge 3.0 input as well as output. QuickCharge 3.0 output lets you recharge Quickcharge 3.0 phone ssuch as LG V30 up to 80% in 30 mins. It will also recharge QC 2.0 compatible phones such as Samsung S9, S8, S7, S6 etc to 50% in 30 mins. QuickCharge 3.0 input lets you recharge the powerbank in just 3.5 hours using a QC 3.0 wall charger. RAVPower 10000 QC 3.0 will also charge all iPhones at quite fast 2.4 amp charging speeds ( 50% in about 40 minutes). While buying RAVPower 10000 QC 3.0 portable charger, do not forget to benefit from discounts available with the product. PowerCore 20100 rules when it comes to low cost high capacity chargers that are also lightweight as well. PowerCore 20100 is an all-round champion thanks to its light weight, good capacity, and lower price than fancier Quickcharge portable chargers. PowerCore 20100 has two 2.4 amp ports with max combined output of 4.8 amp. This means it can simultaneously charge two iPhones (iPhone 7/6s/5s) at fastest possible speed. The highlight feature of PowerCore 20100 portable charger is its low weight (12.5 oz) which makes it the lightest 20100 mAh charger in the market. PowerCore 20100 will charge iPhone 8, 7, 6S six times and iPhone X, 8 Plus, 7 Plus four times. It will fully charge Samsung S9, S8, S7, etc four times. PowerCore 20100 can be fully charged in 10 hours with a 2.4 amp wall charger. PowerCore 20100 charges most Android and iPhones such at up to 2.4 amp max charging speed – about 35 to 50% in about 45 minutes. Supports 12 watt fast charging for all Android smartphones including Samsung S9, S9+, S8, S8+, S7, S6, Note 8 etc. Takes 10 hours to charge. RAVPower 22000 is easily the best value for money heavy-duty 20000 mAH class portable battery charger. 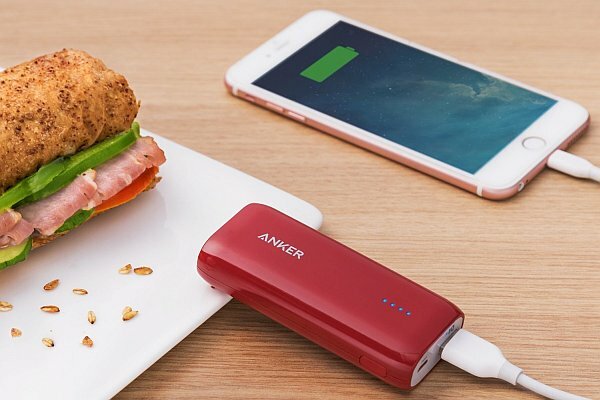 RAVPower 22000 weighs more (14.5 oz) than Anker 20100 (12.5 oz) but compensates for it with its much lower cost and greater battery capacity and total charging output. RAVPower 22000 has three 2.4 amp capable ports (PowerCore 20100 has two) with max combined output of 5.8 amp. This means it can simultaneously charge two iPhones (iPhone 7/6s/5s) at fastest possible speed and a third phone at decent 1 amp charging speed. The highlight feature of RAVPower 22000 portable charger is its low cost considering its excellent build and high 5.8 amp output. RAVPower 22000 can charge iPhone 8, 7, 6S, 5s etc. almost seven times and the larger iPhone XS Max, XS, XR, X, 8 Plus, 7 Plus about five times. 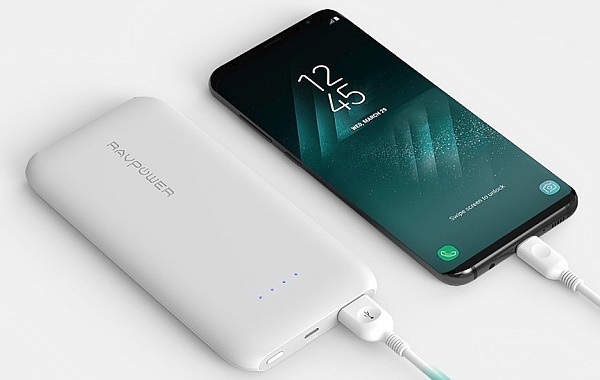 RAVPower 22000 will fully charge Samsung smartphones such as S9, Note 9, S8, Note 8, S7, S6 etc four times. RAVPower 22000 can be fully charged in 11 hours with a good 2.4 amp USB wall charger. This portable phone charger can charge most Android smartphones and iPhones such at up to 2.4 amp max charging speed – which means about 35% to 50% charge in about 45 minutes. Supports fast charging at 12-watt for all Android smartphones including Samsung S9, S9+, S8, S8+, S7, S6, Note 8 etc. 5.8 watt maximum combined output means you can charge three devices at good charging speed simultaneously. Takes 11 hours to charge. Quite heavier than PowerCore 20100 but its low cost with greater capacity makes it an excellent solution for carrying in car, luggage, or for home emergencies. 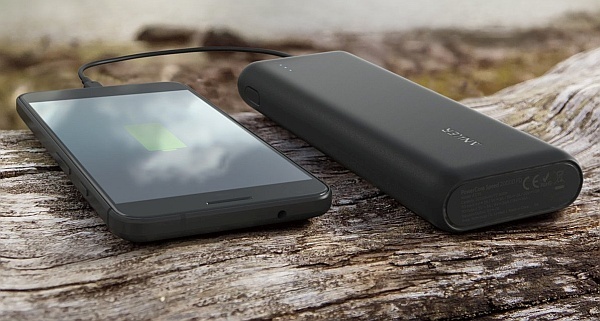 PowerCore II 20000 is our pick among best upper mid-range portable phone chargers. The highlight feature of PowerCore II 20000 is that it supports the fastest 18-watt charging for latest Android smartphones including Samsung S9, S8, S7, etc. PowerCore II 20000 will charge iPhones X, 8, 8 Plus, 7 , 7 Plus, 6, 5 etc. at fast 2.1 amp+ charging speeds. This portable charger has adequate capacity to fully charge Samsung S9, S8, S7, etc four times. It will charge iPhone 8, 7, 6S, 5 six times and iPhone X, 8 Plus, 7 Plus four times. PowerCore II 20000 weighs 13.5 oz and features Anker’s new textured grippy and scratch-resistant design that feels much better in the hand than the older design. PowerCore II 20000 can be fully charged in 5 hours with a Quickcharge wall charger. PowerCore II 20000 portable charger supports QuickCharge 2.0 equivalent Input and Output. It will charge most Android phones such as S9, S8, S7 to about 50% in 30 minutes. PowerCore II 20000 will charge iPhones at fast 2.2 amp charging speed – about 50-60% in about 45 minutes. PowerCore Speed 20000 PD is currently our top picks as a future proof USB PD power bank for the latest and upcoming iPhones and Android smartphones. Apple’s latest iPhones (iPhone X, 8, and 8 Plus) now support 18-watt fast charging over USB C PD that enables 50% charging of phone in 30 minutes. Similarly, almost all new Android smartphones also support 18-watt or higher USB C PD charging. PowerCore Speed 20000 PD portable charger can output a maximum of 22.5 watt of charging power over USB PD making it perfect for charging all new and upcoming smartphones at fastest possible speed. PowerCore Speed PD is not as bulky as the 26800 mAh portable chargers and is priced quite well once you consider that it is bundled with a high quality PD wall charger which in itself costs much more if you buy directly from Apple (Apple stock iPhone chargers cannot fast charge the new iPhones). PowerCore Speed 20000 PD has two ports (One USB C and a USB port). The powerbank weighs 13.5 oz and can charge iPhone 8, 7, 6S six times and iPhone X, 8 Plus, 7 Plus four times. PowerCore Speed 20000 PD will fully charge S9+and S8+ more than three times and Samsung S9, S8, S7, etc. more than four times. The powerbank will also charge Nintendo Switch at its highest speed (18 watt) and Macbooks at pretty decent 22.5 watt speed. Thanks to its USB PD input feature, the PowerCore Speed 20000 PD portable charger can be fully charged in just 4 hours with the bundled PD wall charger. Supports fastest charging for all iPhones – from the latest iPhone 8, 8+, X to old iPhone 7, 6, 5 etc. Supports fastest charging for Android smartphones including Samsung S9, S9+, S8, S8+, S7, S6, Note 8 etc. Bundled high quality 30 watt PD wall charger that can also act as fast charger for iPhones and Macbooks. No option to buy without the bundled wall charger. RAVPower 26800 PD is the lowest cost premium 30 watt USB PD portable charger in the market . The 30-watt USB PD output of RAVPower 26800 PD makes it a fool proof charger for latest iPhones and Android smartphones but also an excellent charger for Macbooks. RAVPower 26800 PD has three output ports in all (one USB C and two regular USB). RAVPower 26800 PD is an especially great choice if you already have a USB C PD wall charger or a Macbook 29 watt wall charger and simply need a high capacity wall charger without any bundled wall charger. This portable charger can charge iPhone 8, 7, 6S, 5s etc. eight times and the larger iPhone X, 8 Plus, 7 Plus about six times. RAVPower 26800 PD will fully charge Samsung smartphones such as S9, S8, S7, S6 etc. five times. RAVPower 26800 PD can be fully charged in 5 hours with ant 30 watt USB PD wall charger or a 29 watt (or higher) Macbook wall charger. Supports the fastest charging speeds for all iPhones – from the latest iPhone 8, 8+, X to old iPhone 7, 6, 5 etc. Supports the fastest charging speeds for latest Android smartphones including Samsung S9, S9+, S8, S8+, S7, S6, Note 8 etc. Charges Macbooks at excellent 30 watt speeds. 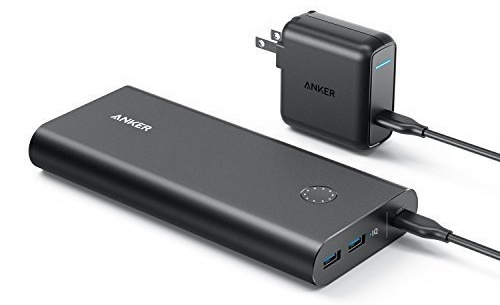 Anker PowerCore 26800 PD is a future-proof 30 watt USB C PD portable charger (powerbank) for latest iPhones and Androids as well as Macbooks and ultrabooks. 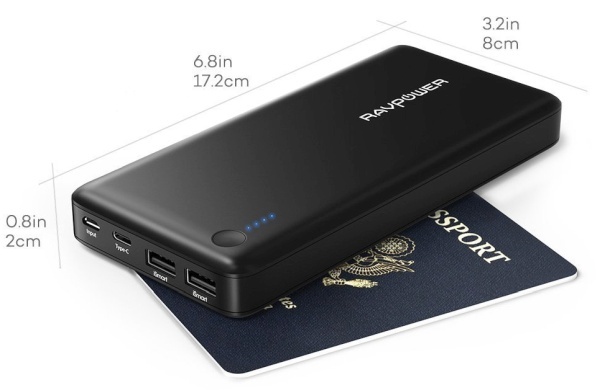 It is available with a bundled PD wall charger and is our top pick among portable chargers with the highest TSA allowed battery capacity. 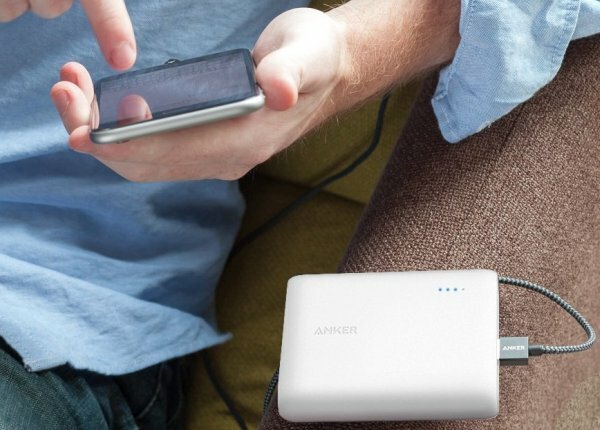 The high capacity also makes Anker PowerCore 26800 PD a great charger for Macbooks and ultrabooks. However, please note that it will not charge top-end USB C laptops such as Dell XPS 15 or XPS 13. PowerCore 26800 PD will fully charge Samsung S9, S8, S7, etc. five times. It will charge iPhone 8, 7, 6S, 5 an incredible eight times and iPhone X, 8 Plus, 7 Plus five times. 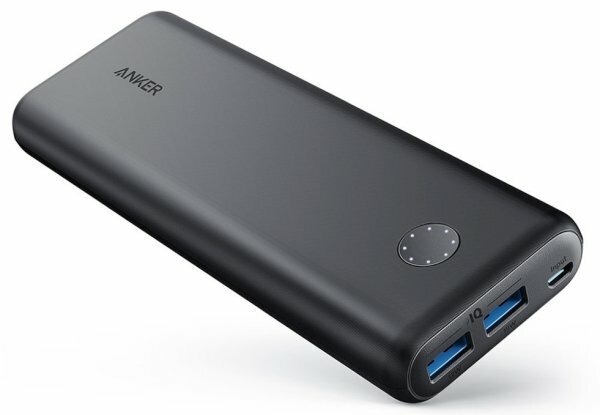 Anker PowerCore 26800 PD weighs 16 oz and comes in a very sturdy design. The PowerCore 26800 PD can be fully charged in 5 hours with the Macbook 29 watt or 60 watt wall charger or the bundled 30 watt PD wall charger. Supports fastest charging speeds the entire range of iPhones – including the new iPhone X, 8, 8 Plus, and iPhone 7, 7 Plus, 6, 6S, 5S. Bundled 30 watt PD wall charger can fast charge new iPhones. Good value for money compared to any other 30-watt PD portable charger in the market. No option to purchase without the bundled PD wall charger. Omnicharge Omni 20 is a unique portable charger that that comes with a portable 110 volt AC outlet as well as DC outlets for running a wide range of electronic equipments such as laptops, speakers, camera equipment, etc. in addition to charging smartphones. The standout feature of this extremely highly priced portable charger is its flexibility. Omni 20 can power most latest laptops due to its 100 watt AC outlet port. The same AC port can be used to power almost any electrical appliance with a power draw of up to 100 watts. Omni 20 comes with variable adjustable DC outlet port – which can output a wide range of DC voltages. In fact, it can output ANY DC voltage from 1 volt to 24 volts including 9 volt, 10 volt, 12 volt, 18 volt, 20 volt, 24 volt etc. with a power draw of up to 70 watt This enables Omni 20 to power a huge range of professional electronic equipment. Another uniquely feature of Omni 20 is its wide range of input power. Omni 20 can be charged with a wide range of input voltages including solar cells in addition to the bundled AC brick. It can be charged in just 3 hours with the bundled AC brick. 1- 24 volt adjustable DC output charges laptops efficiently. A huge range of professional equipment and devices can be charged. Supports pass through charging – charge devices while charging the powerbank. This is a great feature when you are in a hurry and need to quickly charge your power bank and devices simulataneously. QuickCharge 3.0 compatible USb ports are great for fastest charging of Android USB-C smartphones including Samsung S9, S9+, S8, S8+, S7, S6, Note 8 etc. Supports 12 watt fast charging for all iPhones. High price makes it a reasonable purchase only for enthusiasts and professionals. No USB Power Delivery (USB PD) output as of yet. This means that you cannot fast charge iPhone X, 8 , 8+ with this powerbank. You will also be not able to charge Macbooks etc. using the more efficient USB-C port and will have to charge with the AC port on the portable charger. Update: Omnicharge now offers a USB-C version of this portable charger. The Omni 20 USB-C offers USB Power Delivery Output of up to 60 watt making it perfect for charging Macbooks at their maximum possible 60 watt charging speed as well as for fast charging Apple iPhone X, 8, 8+ etc. (up to 50% in 30 mins). 1 year limited warranty is a bit less than ideal for such a highly priced piece of equipment. 20000 mah capacity is less than the 26800 MAH maximum allowed by TSA. For such a high price, 26800 mah would have been an ideal capacity. 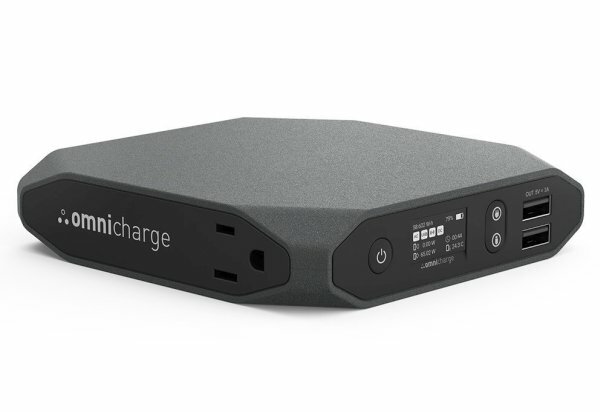 Omnicharge Omni 20 USB-C is a the latest portable charger from Omnicharge and offers an incredible 60-watt USB Power Delivery output support. This means that Omni 20 USB-C is currently the only portable charger in the market capable of charging the latest Macbook Pros at their maximum supported 60-watt charging speed. Omni 20 USB-C has two USB PD ports and can deliver a maximum combined Output of 100 watt (maximum 60 watt from one port). This means that while charging a Macbook Pro the Omni 20 USB-C can also fast charge Apple iPhone X, 8, 8+ at maximum possible speed. iPhone X/8/8+ fast charge draws 18-watt over USB-PD. Besides the two USB-C PD ports, the power bank also has two USB ports with maximum output of 3 Amps – perfect for charging phones at pretty decent speeds. However, the Omni 20 USB-C does not have any AC outlet or variable DC output ports like the Omnicharge Omni 20 mentioned above. Another unique feature of this portable battery bank is the in-built USB-C hub that allows you to transfer files while charging the laptop. The power bank itself can be recharged in a blazing fast 3 hours using an 45-watt USB PD wall charger. Please note that a USB PD AC wall charger is not included with the Omni 20 USB-C. You can use a good 45-watt USB-PD wall charger such as the iClever 45-watt USB-PD wall charger or the Apple 60-watt wall charger to charge the Omni 20 USB-C.
With a weight of just 1.1 pounds (506 gram), the Omni 20 USB-C is an excellent companion for Macbook owners. Two USB-C PD ports make it great for charging Macbook at max speed and fast-charging iPhone X, 8, 8+ simultaneously. Two additional high output (3 amp) USB ports charge will charge almost all smartphones at pretty high speeds of 2 amp to 3 amp. Pass through charging – the ability to charge devices from the powerbank while charging the powerbank – is a great time-saving and convenient feature. It also allows you to make maximum use of of a single AC wall outlet by enabling you to charge all your devices at once. Supports 12 watt (2.4 amp) fast charging for all iPhones. The informative OLED panel provides accurate battery status info, better than any other portable charger in the market. 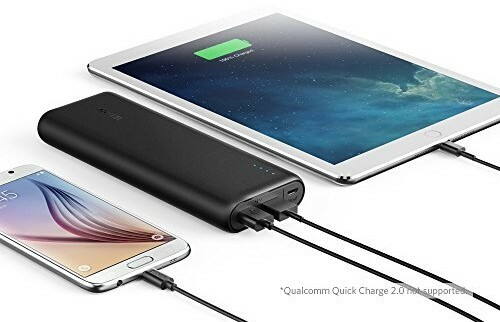 High price compared to other USB PD portable chargers such as the excellent and higher capacity Anker PowerCore 26800 PD , RAVPower 26800 PD and Anker PowerCore Speed 20000 PD makes it a justifiable purchase only for serious enthusiasts and professionals who want the 60 watt maximum Macbook charging speed. All other PD chargers charge at half speed i.e. 30 watt. No included USB PD wall charger makes it an even more expensive purchase. A 45-watt USB PD wall charger adds another $30 to the purchase price. Its competitors, Anker PowerCore 26800 PD & PowerCore Speed 20000 PD come with a bundled USB PD wall charger. 1 year limited warranty is not adequate for such a highly priced piece of equipment. The 20000 mah or 73 Wh capacity of this portable charger is less than the 26800 MAH (100Wh) maximum allowed by TSA. 26800 mah would have been an ideal capacity if one is paying such a higher price premium. The charging efficiency of this portable charger (about 70%) is quite less than Anker or RAvpower competitors (about 90%). This means that a lot of battery capacity goes waste. Omni 20 charges a 2017 Macbook Pro about 1.1 times while Anker PowerCore 26800 PD will charge it twice. while costing about half that of Omni 20 USB C.
Hey! Love your site and hoping you can help. My wife and I are taking a trip and have 2x moto g4s and might also bring our samsung digital camera. We will do a little hiking, but no situation where we will go more than 12 hours without access to a charger. I am leaning towards RAVPower, mostly because they seem fairly trustworthy and the price is right. Based on your suggestion above, the RAVPower 10000 QC3 would be a good pick at $23.99 a piece after the current promotion, totaling approx $48 for two of them before tax (one for each of us). However, there is also a promotion where I can get the RAVPower 10000 QC and the RAVPower 22000 for $62 before tax. 22000 does not appear to have Qualcomm QC. Should I stick with the 2 x RAVPower 10000? We will recommend the RAVPower 10000 QC3 due to its extremely useful Quick recharging/charging features supported by your Moto G4 Plus phones, much lower weight and lower price as well as your charging requirements (less than 12 hrs). 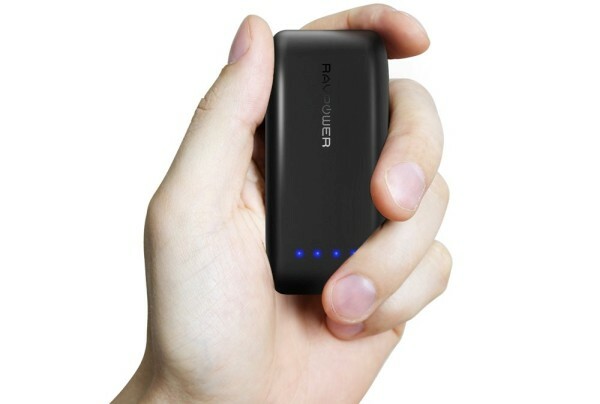 RAVPower 10000 QC3 is also slim and light enough to use on the go as well. Weight is a very important consideration here as you will save a full 1-pound (~450 gm) weight by opting for the RAVPower 10000 QC3. Another handy advantage of RAVPower 10000 QC3 over the RAVPower 22000 is that you can use your Moto G4 Plus Turbo wall chargers for rapidly charging the RAVPower 10000 QC3 powerbanks as well. PS. Also, in case you want to charge all 5 devices (2 phones + 2 powerbanks + camera) from one AC outlet simultaneously, for ease of use/packing, you can consider a good 5 port USB wall charger with QC 3.0 such as Anker 63 watt 5-port wall charger. It has 2 quick charging ports to top-up QC 3.0 powerbanks (or phones) at maximum speeds and 3 other USB ports. RAVPower also has 4/6 port chargers but Anker 5-port wall charger’s 63 watt total output and 2 Quickcharging ports is better than similar RAVpower wall charger (60 watt, 5ports, 1 QC port0 for about $5 extra. Thank you very much for your input! Just ordered 2x ravpower 10000 and made sure to use your links : ) I will see how things go on this trip and keep the 5 port charger in mind for the future. Thanks again and have a wonderful night/day! Also, I think it would be a great idea to add a section on well reviewed / quality USB-C cables as this especially important for those ppl wanting to properly power their Macbook or Chrome laptops. I had a difficult time confirming the quality of the usb-c to usb-c cables on Amazon trying to find a one capable of handling 5a/100w. 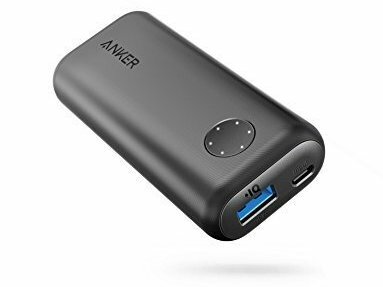 Hi John, Thanks for the suggestions, We will be updating the page with the new Anker powerbank model # A1275 once we review it. We will also soon be adding a section with quality USB-C cables.